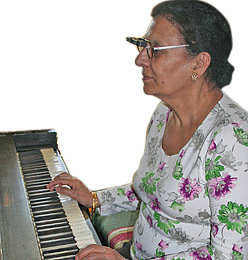 Reading music is perhaps one of the most challenging activities for the visually impaired. Seeing the notes and their position require very fine detail vision usually required higher magnification, while being able to track across the bars requires a wide field of view. When reading music with a bioptic system try to maintain the furthest distance possible from the music stand. In addition, the working distance to see the music needs to be far enough away (mid-range) to allow room for the hands and the instrument. The only optical devices that can provide a high level of magnification at mid-range are telescopes set for near—they can either be focusable or fixed focus for the desired working distance. Unfortunately, the stronger the magnification of the telescope the narrower its field of view. Fortunately the field of view of telescopes is like a cone—the further away you are from the material the wider its field of view. Determine the furthest distance that the individual can be from the music stand—it can be further than arm’s reach as they can lean in to turn the page when necessary. Place a sample of music they want to read on a stand at that distance. Make certain it’s well illuminated. Position a Keplerian telescope in front of their preferred seeing eye with their distance correction in place (if any) with a power that provides ample magnification to achieve 20/40 (6/12) at distance. Focus the telescope for the working distance determined in step #1. Determine whether the telescope provides enough magnification for the user to read the music. If they can read it well, try a lower power device to gain a wider field of view. If they cannot read it well, try a higher power device to provide higher magnification. 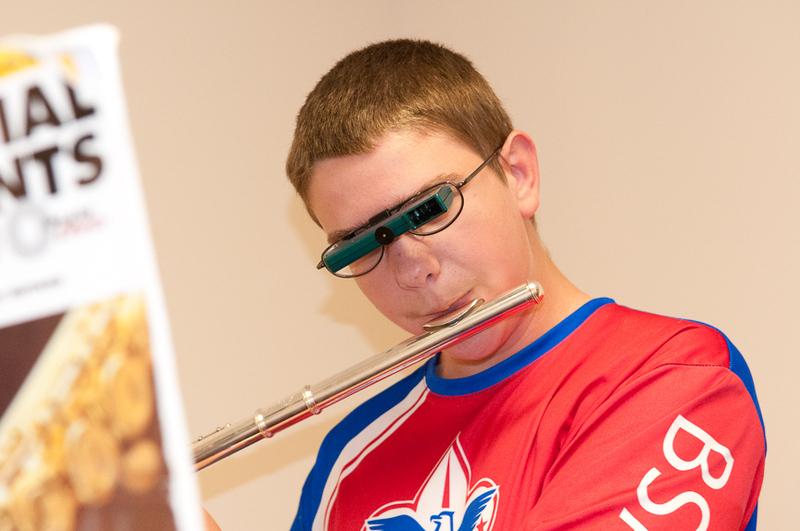 Determine if the field of view is wide enough for the user to read the music fluently. If they cannot track fluently, try to increase the working distance (and refocus the telescope). A binocular device may be able to provide a wider field of view, however you need to determine the most promising working distance first so that the binocular telescopes can be aligned and converged for that distance. Determine whether the music will be at eye-level (piano) or lower down. This will help determine the proper position and angle of the telescope in the carrier lens and frame. If the user will be with a group and/or a conductor, they’ll likely prefer a bioptic design so they can alternate their visual attention between the conductor, fellow players and the music. No matter how wide the field of view can be achieved, it still will cover only a few bars of music. Users will need to learn to move their head and eyes together to track along the page.